I often do a lot of schoolwork in my head when I’m out on my evening constitutionals (a dork’s way of saying walk). Lately I’ve been composing my blog posts as I stroll through Queen’s Park watching the antics of the gigantic black squirrels with a mixture of amusement and apprehension. (Conversely, I’ll unwillingly write them at night when I’m trying to sleep, which is infinitely more annoying as I then have to turn on the light and jot down all my clever turns of phrase and witty stories on my bedside notepad. Do you have one? You really should if only for the amusement value. I woke up to see “flying eye mask” jotted down in all seriousness one morning.) Anyway, tonight I realized that if you and I are going to have an open and honest relationship, well then I’d better share with you the manifesto that outlines some of the most important things in my life. It’s a fairly recent addition in its written form and I’ll tell you the story of its genesis meow. 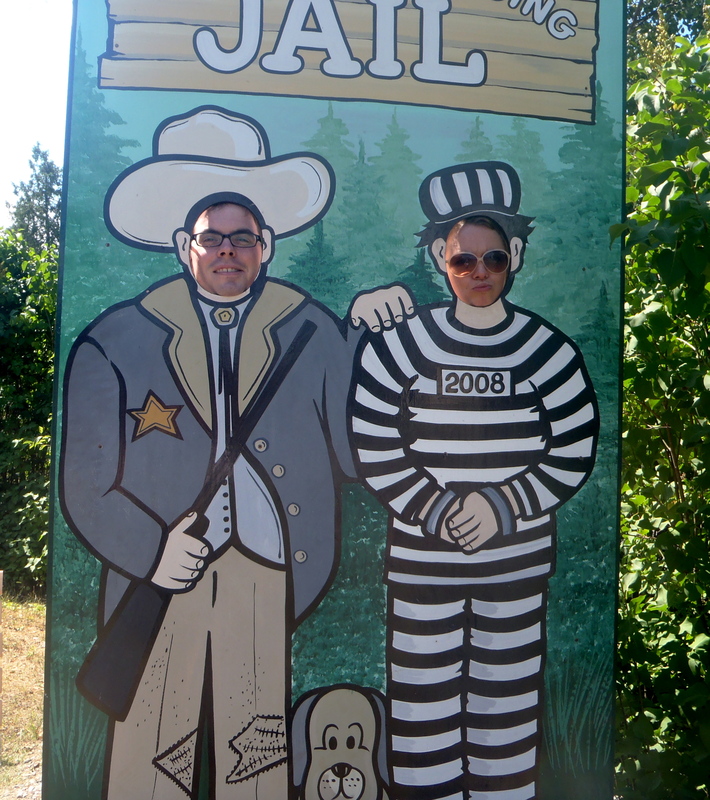 This pic illustrates several of my points: being silly, having fun, and spending time with friends. Plus who can resist those ridiculous cut outs? I have yet to see one I haven’t stuck my big ol’ head in. Last week at IHN we started a new course called Professional Practice where we learn how to be super successful and run a business. During the introductory class we did several different exercises, which I thoroughly enjoyed, but one in particular stuck with me. We were told to address a letter to a child containing all the worldly bits of wisdom we’ve acquired thus far. In a twist worthy of an M. Night Shymalan movie, after we had finished the exercise we were told that these letters were actually addressed to ourselves. Whoa. Mind=blown. The point, I believe was to show us that we have the wisdom to live a fantastical life inside of us, we just don’t always recognize it. 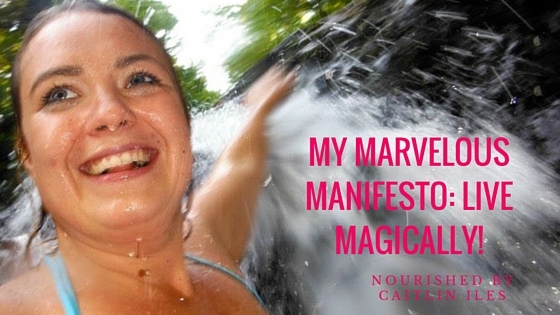 I decided to take my exercise and after a little bit of tweaking, turn it into my marvelous manifesto. So without further ado, welcome to my world! Love unconditionally. Make every day count in whatever way feels right. Eat real food. Go dancing. See live music in a field. Swim naked. Smile often. Be kind. Appreciate family, even when they piss you off. Work hard; play harder. Laugh daily. Read books; not always serious ones. Be authentic. Give hugs. Be compassionate. Trust yourself. Love your body; it’s the only one you get. Sing at the top of your lungs. Be open. Don’t take yourself too seriously; no one else does. Be silly. Breathe. Push boundaries. Have fun. Always make time for friends. When things get hard remember that this too shall pass. Be whimsical. Go outside. Walk barefoot. Run. See waterfalls. Ride horses. Go skiing. Be epic. Be happy. Yer a wizard, Caitron! 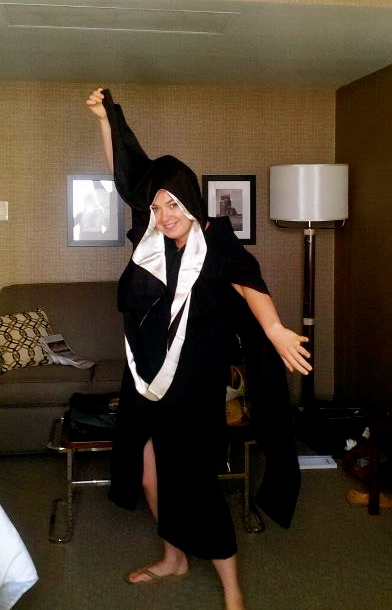 This…costume is the ridiculous graduation gown they made me wear to get my MA. It was so silly, my mims and I had to dress up in it and take pictures. PS: I just tasted my kombucha and it is ready to go! I’m going to pour it into jars and flavour it with different fruit juices tonight. Then I’ll seal it up for a couple of days and it should turn out nice and fizzy and super delicious! I’m thinking I’ll do a blueberry juice since I have a gigantic bag of wild blueberries. I also found a hunk of ginger hiding away in my fridge so I may do a ginger batch as well. I’ll update you on its taste in a couple of days.